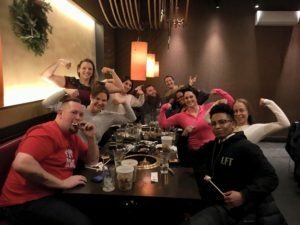 A few months ago I was invited to a local T1D meet up. About ten or so hungry peeps with diabetes met up at a restaurant in Philadelphia, and I was grateful to be among friends. One of the fun and interesting things about sitting at a table with a bunch of other T1Ds is that my Omnipod PDM was among many on the table. My friend Roz picked mine up and when she hit the home button and the screen came up, she realized it wasn’t hers – and she noticed something else, too. 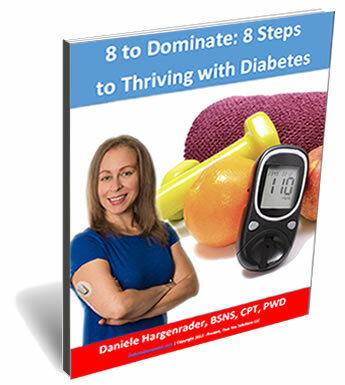 She noticed something that I have always done with my Omnipod PDM, which she called a “diabetes adulting hack,” and she encouraged me to share it, which is what prompted this post. 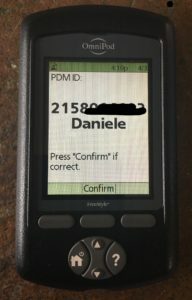 One time in my beginning stages using Omnipod about six years ago, I left the PDM (essentially the receiver needed to bolus, change sites, and everything else that controls the pump) at a restaurant. As you may know, the feelings of dread and anxiety involved when a piece of your pump or CGM equipment is broken or lost is palpable to say the least since you will have to either find it, replace it, and/or go back to manual injections until you are able to get a hold of a PDM. Either way, not having your PDM will be taking up ALL of your thought cycles until you get it back! I put my phone number on the front screen which is always the first thing you see when you press the home button to operate the pump. We received a call from the restaurant saying they had found my cellphone (LOL – most people would have no idea what the PDM was if they found it randomly) and boy was I grateful they did. Since then, I highly recommend everyone who has an Omnipod does the same thing. First, enter your phone number, then your name as shown in the pic. That way you have an extra layer of insurance if you ever leave your PDM somewhere out in the wild. Please share this with anyone who could benefit from doing this for themselves or their kids! How secure is one’s insulin pump or CGM data or personal information on these diabetes platforms? We have reports from AI experts that it’s quite easy to hack into one’s insulin pump & change insulin doses. We know from recent hearings in Congress personal data on Facebook & other social media isn’t secure & is being used far & wide for various purposes. Although it may be possible (can’t find any stories of any incidents of this happening in real life to prove that it is possible at this current time), I feel that the benefits of using a pump and CGM far outweigh the risk of hacking for me personally. If you have any links to any information from the AI experts you mention that you could share with me, that would be great. Thanks for reading!